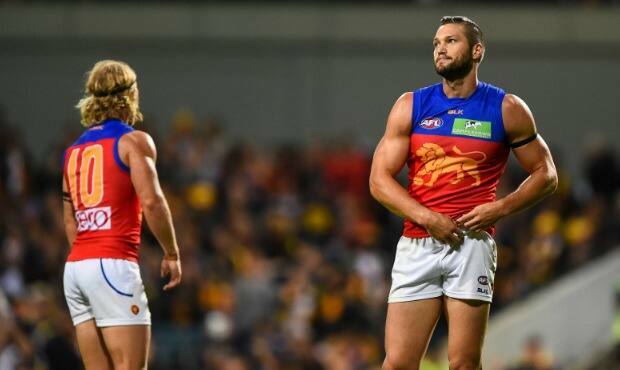 29 year-old Lions ruckman and Ultimate Sports Nutrition (USN) ambassador Stef martin recently sat down to answer muscle building and nutrition questions from the Lions and fans. This in-depth Q&A, along with last week's answers from High Performance Manager Damien Austin, are thanks to the club's official supplements partner USN. USN is currently offering Lions Members an exclusive 25% off products ordered online (check your 'Member Benefits' email for your exclusive code). Lions fans can also get 20% off all Core Range Products (as used by the Lions) and all Performance and Weight management products using the code USNLIONS. Lions Q: When you came into the league you weren’t as muscular as you are now. When did bulking up become a focus area for you and what do you think helped achieve it? I’d never lifted a weight until I got into the AFL system (age 21), but now being at a training age of 9 or so years, it makes sense that I, or any other player, would be better built than when we began. I have become more systematic with my approach over time though, recording every rep I’ve done over the past 3+ years so that I can track my progress and make sure I do in fact keep getting stronger. I’ve found this to be critical to gaining strength and size. Lions Q: You’re one of the older players at the Club and have played 100+ AFL games, but Leppa thinks you can still notch up another 100 games in your career. What do you attribute to your longevity? I’d say the fact that I started AFL at a late age should help my longevity; having exclusively played basketball until age 19 has meant that my body has had less wear and tear than guys who may have played for an extra decade in their junior and adolescent years. Lions Q: What role do you see supplements playing in your fitness regime? Can you explain what supplements you will take during the course of a typical training day? I, like most athletes and gym-goers, use whey protein powder (USN) on a daily basis. This supplement helps me hit my protein intake goals, which can be difficult if relying on food alone. I find adding it to a smoothie is an easy way to get a protein hit in the morning, while getting lots of micronutrients into my system through the other ingredients I add. I’ve also used BCAAs (Branched Chain Amino Acids) at times, which may help keep the body anabolic during a gym session, if taken intra-workout. Lions Q: What role do you see nutrition playing in your ability to build and maintain muscle? Can you explain what you would eat during a typical training day? It's hardly outlandish to say that nutrition is critical to building and maintaining muscle, but it’s true. Anecdotally, and from what I’ve learnt from others, I’d suggest that first and foremost a high protein intake (for me 250+ grams per day) is necessary to build or maintain muscle. If you are trying to add size then this should be coupled with a slight caloric surplus; if you are trying to lose body fat you’d need to couple with a caloric deficit. I used a diet-recording app on my phone for a year or so to make sure I was eating slightly more calories than I was burning (caloric surplus), and also to track my protein intake, though now I do it more by estimation. In a typical day, I begin with a smoothie with lots of simple carbohydrates from fruit as well as protein powder and leafy greens. Lunch tends to be a lean meat with salad, plus or minus a carbohydrate source depending on training loads. Dinner is similar, though I tend to avoid carbohydrates altogether. I have snacks throughout the day also, which can include protein shakes. Lions Q: There are kids, teenagers and adults all looking at your physique as inspiration. What advice would you give to them? Firstly thank you, I’m humbled by your comment. Secondly, though far from an expert, I would suggest a few simple things which might help. Nutrition is critical, as I discussed previously. Also necessary for increased size or strength is adherence to the principle of progressive overload, which basically just means that you increase the weight (or reps at the same weight) you can lift for a particular exercise over time. Because of the importance of this principle, I like to limit the exercises I do largely to fundamental lifts, so that I can track progress of these key lifts over time and force myself to deal with increasing weight. Lastly, but probably most importantly, is discipline. It is an underrated element of the achievement of any strength or aesthetic goals, but if you aren’t completely committed to a long-term and consistent approach then you’re wasting your time; building strength and muscle is a slow process. Fan Q: How do you keep your muscle size throughout the year with all the running? Are you eating 6-7 meals per day? I probably do eat about 6 meals a day, but more importantly I aim to get a 30g protein hit every 2-3hrs, with total protein consumption at around 200-250g per day. I have a lot of simple carbohydrates as part of my 2L breakfast smoothie that I make every morning to give me energy for the day, and cut back on carbohydrates later in the day. I have also tracked my total calories at times to keep body fat percentage low. Fan Q: With regards to muscle gain in relation to footballers how difficult is the balance between size to endurance (i.e. the capability to take the hits yet cover as much ground as possible)? The two are opposed to each other and so it can be really challenging, especially for younger players who typically find it harder to build and keep muscle. Deciding your ideal playing weight is tricky too because, as you say, we have to find a balance between strength/size and endurance. Players usually try playing at different weights over their career and see what feels best for them, but unfortunately there’s always a trade off and we can’t be the best at both. Fan Q: How many weights sessions would you do during the off season and alternatively then do during the home and away season? What do the sessions involve? I do the same amount of sessions in the off season and home and away season, which is one every day. In the off season I really try to make strength improvements in the lower body, which tapers off during the season as we need recovery and taxing our nervous systems can be counter-productive to game day performance. The sessions involve lots of heavy compound lifts. The major lifts for the lower body include deadlifts and squats, while upper body movements include bench press, dumbell rows and shoulder press to name a few. Fan Q: What are some of your favourite exercises for building muscle? I like the deadlift for building a strong back, the bench press for chest, and lateral raises for shoulders. I make sure that I progressively increase the weight of these fundamental lifts as time goes by, to make sure my muscles are forced to deal with heavier and heavier weight (this is called progressive overload). It’s important to keep challenging your muscles in this way to force your body to keep getting stronger, or bigger, depending on your goals. Access 20% off all Core Range, Performance and Weight management products from the USN online store using the code USNLIONS.